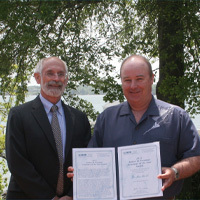 This year’s Freeman Award goes to Dr. Ken Neill, a Yorktown dentist, for his exceptional efforts to promote fisheries research and the education of VIMS graduate students. When not attending to his dentistry practice in Yorktown, Ken is on the water as captain of the Healthy Grin. An expert angler, Dr. Neill has been an invaluable collaborator on several VIMS studies that use pop-up satellite tags to study post-release survival, habitat use, and movements of marine sportfishes. Dr. Neill has donated weeks of his time to assist with tagging studies of billfish off Venezuela, and has provided VIMS faculty and students with opportunities to collect samples from the Healthy Grin. Ken is a great teacher and his expertise and love of fishing is infectious. He has helped at least seven VIMS graduate students with their thesis research, taking them aboard his vessel for a unique educational experience, teaching them how to fish, and introducing them to other captains willing to help them with their field work. He is truly deserving of the Robert M. Freeman Volunteer of the Year Award.